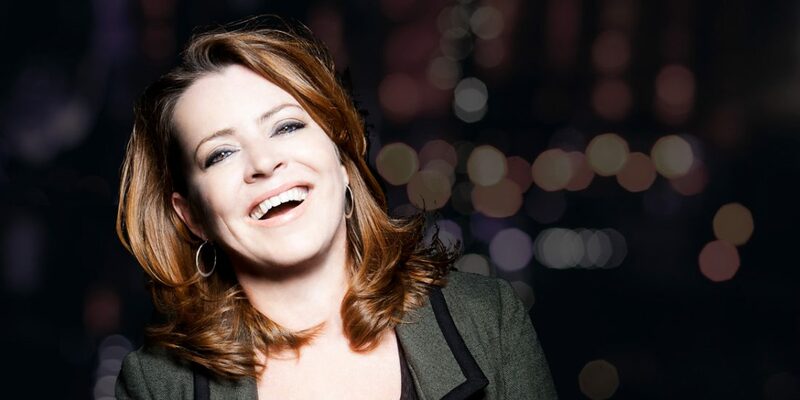 Kathleen Madigan (born September 30, 1965) is an American comedian and TV personality. In addition to her stand up comedy performances, she is a regular guest on a variety of U.S. television programs. Kathleen Madigan is one of seven children in the large Irish Catholic family of Jack and Vicki Madigan, a lawyer and a nurse respectively. She grew up mostly in the St. Louis suburb of Florissant, although the family also lived for periods of time in House Springs, Missouri and in the Lake of the Ozarks region of central Missouri. Madigan received the first eight years of her education largely in private Catholic schools, although she also attended the public school of the Osage. It was there she excelled as a student athlete, participating in volleyball, track, and basketball. In the latter, she set a record by winning the 1978 Mid-Missouri Hoops Shoot Championship. At the time 4’5″ tall, she was the shortest person to ever win the event. She shot under-handed, sinking 14 of 15 attempts. Madigan attended McCluer North High School, graduating in 1983. She admitted in a 2012 interview with St. Louis Magazine, however, that she participated in few activities like float decorating or prom, choosing instead to work at a steakhouse where she could make up to $200 per night. Madigan attended University of Missouri–St. Louis for two years, but, according to Madigan, all she did was accumulate $7,000 in campus parking tickets. At Southern Illinois University Edwardsville, she earned a B.A. in Journalism in 1988. While at SIUE she was in charge of the student newspaper and also served an internship with the St. Louis Blues professional ice hockey team.